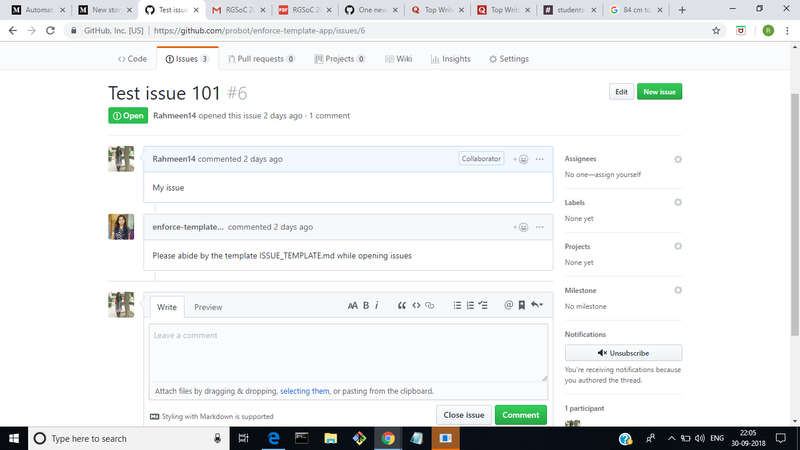 As students for Rails Girls Summer of Code 2018, my friend Akshita Aggarwal and I of team $we init built 2 bots to automate GitHub workflow under the Probot organisation. We achieved this under the amazing mentorship of Gregor Martynus (maintainer of Probot) and our 4 coaches who volunteered to help us during the summer. A bot that ensures exactly one newcomer issue is assigned per person so that it’s fair for all newcomers. Here’s a link to a detailed blog on the same. The Bot will require new Issues and PRs to use the respective templates and fill out their fields. It will check that the template was actually used instead of deleted by ensuring that keywords are present in the body. It reads the template accordingly (based on whether it is an issue or a pull request that was opened) and then stores the fields present in the template in an array. Then it takes the issue body and checks for the occurrence of each of element of the array of template fields in the issue body. We also want to ensure that the content filled against these fields is relevant and not some random gibberish. You can open issues and send PRs to our repository.